Tirana is the capital and biggest city of Albania. It is a great city to stop through even though it does not have a large number of attractions for visitors. An interesting history, a relaxed atmosphere, and a lack of tourist crowds are all reasons to visit Tirana. The city center is easily walkable, clean, and attractive. Tree lined streets in the city center add aesthetic appeal in addition to offering some protection from the summer sun. Like the rest of Albania, the 20th century was turbulent for Tirana. Having began the century as a relatively unimportant town under Ottoman rule, Tirana became the temporary (later permanent) capital of independent Albania in 1920. This set it on a totally new trajectory. When Albania came under Italian hegemony, Tirana was a focus for Italian projects. During World War II the city was occupied by both the Italian and German militaries. The end of the war ushered in nearly five decades of communist rule. The end of communism in the early 1990s opened Albanian markets, politics, and culture. All of these periods left physical marks on the city that make spending a day walking around a worthwhile activity. The center of activity in Tirana is Skanderbeg Square. A large statue of the national hero sits in the middle of the square next to an Albanian flag. During the communist era the square was pedestrianized and largely covered in concrete. Now several lanes of traffic surround the green space where Skanderbeg’s statue stands. A statue of the communist dictator, Enver Hoxha, was pulled down during a mass protest in 1992. This area is now a small park with benches and trees in front of the National Historical Museum. Tirana’s most significant road is Bulevardi Dëshmorët e Kombit (Boulevard of the Martyrs). It runs through Skanderbeg Square and a walk down it will allow you to sample all of Tirana’s architectural periods. Very little of Tirana’s Ottoman past is still visible, however the Et’Hem Bey Mosque, built in 1823, stands prominently across several lanes of road from the Skanderbeg statue. It was closed during the communist period because of Albania’s state atheism. Several government buildings around Skanderbeg Square were designed by a handful of notable Italian architects during the 1930s. Further south down Bulevardi Dëshmorët e Kombit is the Lana River. The river itself is not very wide and the water was low when I visited. It was incredibly during and following the communist period. Today it has been mostly cleaned up and a stroll along its banks is another worthwhile activity. On the south side of the river is the unmissable Pyramid. This eye sore was orginally designed to house the Museum of Enver Hoxha after the dictator’s death in 1985. It sits mostly empty and covered in graffiti these days. An art installation out front, the Peace Bell, was made of metal from bullet cartridges used during the anarchic period in the mid-1990s. Near the end of Bulevardi Dëshmorët e Kombit are several communist era buildings The well manicured Presidential Palace used to be the Soviet embassy until 1961, when Albania broke off relations with the USSR. The Palace of Congresses, where the Communist Party held its most important meetings is across the street. At the very end of Bulevardi Dëshmorët e Kombit is Mother Teresa Square. The buildings in this area are among the most noticeably ugly buildings in the city. Structures here were built during the World War II occupation by Fascist Italy. Unlike earlier Italian constructions, these bland imposing buildings lack any charm. The largest building is now part of a university. Mother Teresa Square. The middle area is a promotional plaza from T-Mobile. Just beyond Mother Teresa Square is the Grand Park. This wooded area is quiet and relaxing. There are plenty of trails that will take you to restaurants, an artificial lake, and plenty of spaces you can make your own. Three distinct grave sites and memorials sit within a few hundred feet of each other in one corner of the park. A memorial to German soldiers who died in Albania during World War II is off to the side and easy to overlook. Some German soldiers are buried at that location. The tombs of three Albanian brothers who were early activists in the Albanian indpendence movement are laid to rest in a shaded area. Lastly, a small graveyard for British Commonwealth soldiers who died in Albania is along the trail and easily spotted. This particular memorial site has an interesting backstory. The British military had limited military activity in Albania during World War II. Those servicemen who died in Albania and whose bodies were not immediately recovered remained in the country following the war. Efforts to repatriate them were made impossible by the communist government. When communism fell these Commonwealth servicemen were given a place of honor in the Grand Park and the site is officially looked over by the Commonwealth War Graves Commission. A large red granite slab sits in the middle of the cemetery. This once stood over the grave of Enver Hoxha. 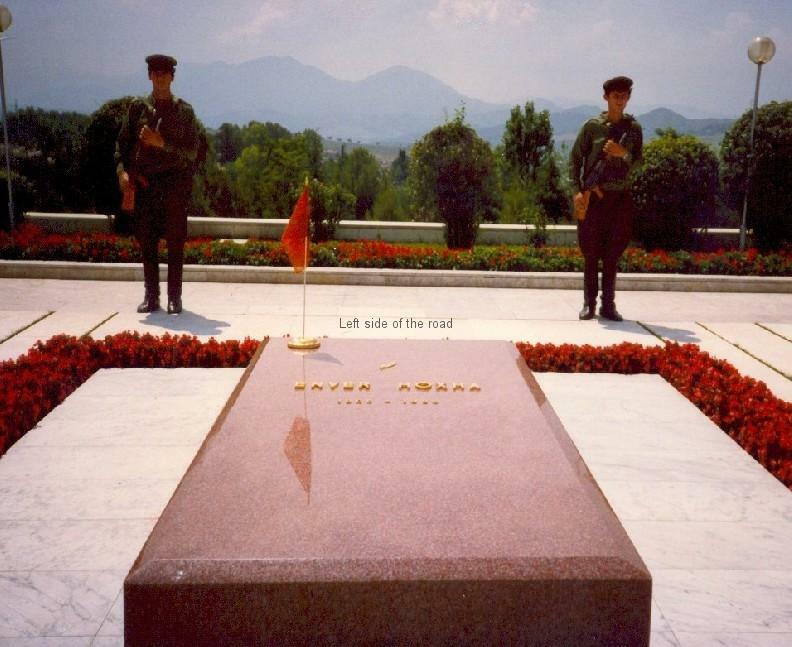 However, Hoxha's body was exhumed from its elaborate tomb in the Martyr's Cemetery in Tirana and moved to the public cemetery after the fall of communism. The holes in the granite from where Hoxha’s name was fixed in place can be observed in the British monument. The memorial monument that was once over Enver Hoxha's grave. Notice the small holes above the middle plaque. Two museums in Tirana worth visiting are the National History Museum and the National Art Gallery. Both are located around Skanderbeg Square. Unfortunately, neither museum allows photography inside, so you’ll have to settle for my descriptions. The National History Museum is eye catching from Skanderbeg Square because of its prominent mosaic depicting Albanian history from early Illyrians to the post-communist era. Parts of it are well signed in English, while other parts lack any English signs. The museum is enjoyable enough, but English signs do make a difference. A section on the victims of communist terror provided a glimpse into communist regime's brutality. Mementos from individuals who were imprisoned or executed by the regime are on display. It is apparent that this is one of the newer exhibitions at the museum. The National Arts Gallery is small. Seeing as how the focus of the museum is on paintings and Albania does not have a long tradition of painting, this makes sense. Most of the Albanian paintings on display are less than a century old. Pre-communist realist paintings occupy a small alcove. The bulk of art on display is of the socialist realist style. Huge paintings of partisans fighting Axis forces and Hoxha during the liberation of Albania cannot be overlooked. Admittedly, I am a bit of a philistine when it comes to art, but I can appreciate socialist realism because of its straightforward nature and my fascination with communist states. George W. Bush is a polarizing figure. That feels like stating the obvious. Some say his painting “lacks any sort of conceptual skill or depth”. Another critic notes that Bush “has an uncanny ability to translate photographs into more awkward images enlivened by distortions and slightly ham-handed brushwork”. One of the biggest surprises that may come while walking around Tirana is that the reclusive painter has a street named after him. Rruga George W. Bush is located near Skanderbeg Square. The street was named for Bush after his 2007 visit to Tirana. It may seem strange at first, but Bush and the United States are very popular in Albania. If you look around Tirana the flag you’re most likely to see after the Albanian one is the American flag. There’s good reason for that. Bush’s popularity, in large part, stems from that 2007 visit. No other sitting president had visited the country before. Besides the Rruga George W. Bush, Albania also issued a stamp of Bush and a small town erected a statue of him. That can tend to make an American president popular in a locale that tends to get overlooked. I saw the same phenomenon last year in Myanmar with Barack Obama. As a relatively poor country with a complicated history, Albania can look to the United States aspirationally. No matter how cynical your view of the United States is, as an idea it remains something that much of the world looks up to. The pro-American sentiment is also a legacy of the American role in the Kosovo War. Kosovo is majority ethnic Albanian. The NATO campaign there and subsequent American support for independent Kosovo has bolstered American standing with the Albanian population.